VATICAN CITY, MARCH 29, 2010 (Zenit.org).- Physical weakness never affected Pope John Paul II's "rock-like faith," Benedict XVI affirmed today during a Mass for the fifth anniversary of the Polish Pontiff's death. Benedict XVI celebrated a Mass for the repose of John Paul II's soul today though the anniversary of his death is April 2, which this year falls on Good Friday. In his homily that reflected on the biblical readings for the liturgy, the Pontiff spoke of the charity toward Christ shown by Mary when she anointed his feet with oil. He said that John Paul II's whole life unfolded in the sign of charity, "of this capacity to give himself in a generous way, without reservations, without measure, without calculation." "What moved him," the Pope said, "was love for Christ, to whom he had consecrated his life, a superabundant and unconditional love. It is precisely because he drew ever closer to God in love, that he was able to make himself a fellow wayfarer with the man of today, spreading in the world the perfume of the love of God." The Holy Father said that those who worked closely with John Paul II could sense his "certainty 'of contemplating the goodness of the Lord in the land of the living,' [...] a certainty that accompanied him in the course of his existence and that, in a particular way, was manifested during the last period of his pilgrimage on this earth." The Pontiff affirmed that John Paul II's "progressive physical weakness [...] never affected his rock-like faith, his luminous hope, his fervent charity." "He let himself be consumed by Christ, for the Church, for the whole world," the Pope said. "His was a suffering lived to the end for love and with love." Benedict XVI gave a special greeting to Polish pilgrims who participated in the Mass, saying their countryman represents a particular responsibility for them. Past articles on this site have reviewed the various ways in which Karol Wojtyla/John Paul II defected from the Catholic Faith ("Connecting" with Betrayal, Baal, Yes, Most Holy Trinity, No and "Thumbs Up" From a Communist for an Apostate are just three of these articles) and the many ways in which offended God by praising false religions and entering into places of false worship and by the many Novus Ordo travesties over which he presided personally. Instead of reciting all of these matters yet again, I would simply want to present fifty out of probably hundreds, if not thousands, of reasons, namely, Wojtyla's "episcopal" appointments, arguing against the "canonization" of Karol Wojtyla/John Paul II even if had been a true pope and even if the church he headed was in fact the Catholic Church, which we know was not the case. Mind you, this is not even to mention a non-bishop, Father Marcial Maciel Degollado, the late founder of the Legionaries of Christ whom Wojtyla/John Paul II protected despite having incontrovertible proof of his moral depravity. Like examples could go on interminably if I was not tired enough already of having to think of the theological, moral, and liturgical disaster that the man for whom I once served as a willing cheerleader, Karol Wojtyla/John Paul II wrought upon the souls of Catholics and non-Catholics alike. It is thus laughable to see conciliarists rushing throw Karol Wojtyla/John Paul II under the bus as they defend Joseph Ratzinger/Benedict XVI, who continues to praise his predecessor's "sanctity." An important constituent element of sanctity is the diligent performance of one's daily duties. John Paul II was derelict in these days by appointing men who, as it should go without saying, committed to the conciliar revolution just as much as he was and looking the other way as reports of moral depravity were placed right square on his "papal" desk. One of the ironies in Ratzinger/Benedict's continued praise of the "sanctity" of his predecessor is that it is possible that the late John Paul II may have spoken rather definitively about his inability to help anyone from eternity. Although the report below, which was published nearly three months ago now, does not "prove" anything as dreams are subject to misinterpretation and misrepresentation, it should have conciliarists some pause for reflection. What if the report is true? What if the false "pontiff," John Paul II, told the husband of a sick woman that he was to pray to "this other priest," not him, for his wife to be cured? 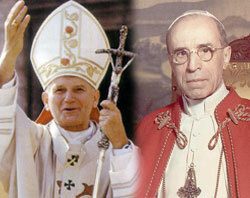 That "other priest," as you probably read three months ago, was none other than our last true pope, Pope Pius XII? What if the report is true? On Tuesday morning, Vatican journalist Andrea Tornielli published an article in Il Giornale describing at length the situation which "mysteriously involves" John Paul II. Tornielli reported that this case was brought to the attention of Benedict XVI shortly before he approved a measure on Dec. 19, 2009 venerating Pope Pius XII's life of "heroic virtue," whose cause had been on-hold for the previous two years. The tests and charts were reconsulted and the initial diagnosis was confirmed. In the absence of the tumor, she had her baby and returned to work. After some time had gone by, she decided to contact the Vatican regarding her experience. According to Tornielli, if they decide positively, the case will be sent on to Congregation for the Causes of Saints for investigation by a team of doctors to declare whether the event was explicable by natural means. If there is no explanation found for the healing, theologians from the Congregation will debate the issue. Only with their "go-ahead" can a dossier subsequently reach the hands of Pope Benedict XVI for official recognition. However, he added, "exceptions might be made for Popes, etc." First of all, we wish to point out the unceasing importance of the Second Vatican Ecumenical Council, and we accept the definite duty of assiduously bringing it into affect. Indeed, is not that universal Council a kind of milestone as it were, an event of the utmost importance in the almost two thousand year history of the Church, and consequently in the religious and cultural history of the world? Karol Wojtyla/John Paul II kept his word to be faithful to the "Second" Vatican Council. Perhaps that is reason enough for the conciliarists to "beatify" him no matter his track record of "episcopal" appointments and the protection of men who were as morally derelict in the discharge of their duties as he was of his. Revolutionaries must always seek to lionize their own. I was a fool for not believing that Karol Wojtyla/John Paul II meant every word of what he had uttered on October 17, 1978. I was a fool for ignoring all of the other signs that we right in front of my eyes until I decided to open them once and for all following the "altar girls" fiasco in 1994, at which point I became, even though I did not realize it at the time, a member of the "resist and recognize" movement. Even then, however, my eyes weren't entirely open as it did not dawn on me that articles that I wrote critical of "John Paul II's" "apologies" and his sitting as an equal with the Grand Rabbi of Jerusalem and a Mohammedan imam on March 25, 2000, and his refusal to discipline the "bishops" responsible for the protection of perverted clergy (see Time For Plain Talk, written in my early resist and recognize days) simply would not be necessary under the pontificate of a true and legitimate Successor of Saint Peter. As I have noted in several articles in the past three years, those in the Motu communities and other venues using the modernized version of the Immemorial Mass of Tradition will have to start "celebrating" the feasts of some of the "saints" "canonized" by the counterfeit church of conciliarism, quite possibly including that of the soon-to-be "Blessed" "Pope John Paul the Great." This "feast" will not be an "optional memorial," to use the parlance of the Novus Ordo rubrics. If actually "beatified" by the conciliar church, as seems might happen sometime later this year, Karol Wojtyla's "feast day" may be ranked as a "feast," which is a rank higher than that of a mandatory "memorial" in the new liturgical order of things in the conciliar world. This would be a bitter pill for at least some priests and presbyters in the Motu world to swallow. Swallow it they will, however, just as they swallow the continued offenses given to God by Ratzinger/Benedict as he esteems the symbols of false religions and praises their places of worship as "sacred." Swallow it they will. We pray to Our Lady in this Easter Octave of rejoicing. confident that the Triumph of her Sorrowful and Immaculate Heart will vanquish the foes of the Faith in the world and in the counterfeit church of conciliarism once and for all. Every Rosary we pray, offered to the Most Holy Trinity through that same Sorrowful and Immaculate Heart, will plant a few seeds for this triumph, especially as we spend time in prayer before her Divine Son's Real Presence in the Most Blessed Sacrament. Alleluia! Christ the King is Risen as He said! Alleluia!